"Great St Mary's" parish church in the centre of Cambridge is unusual in housing two self-contained pipe organs. 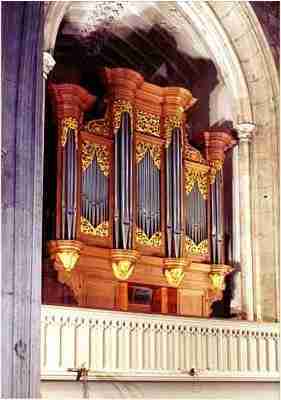 A three-manual and pedal instrument, maintained and used by the regular congregation, is located in the more conventional chancel position, whilst high in a west end gallery stands the so-called "University" organ, essentially a three-manual by Thomas Hill but including significant work by Father Smith. Since medieval times the church has been used by the university as a venue for meetings of various sorts. Although degree ceremonies and other formal events are now held in the eighteenth century Senate House on the opposite side of King's Parade, the "University Sermon" is still preached in the church on two Sunday mornings during term. The original Smith organ was purchased by the university in 1698 and underwent a sequence of rebuildings at various hands over the ensuing centuries, culminating in Hill's substantial remodelling of 1870. The restoration that we undertook during the course of 1995 was the first significant work to be carried out on the organ since 1963, when Hill Norman & Beard made various tonal alterations and enlarged the pedal division using electro-pneumatic chests. Happily, the Victorian mechanical key and drawstop actions were left essentially intact, and an important part of our contract was to restore these back to full and efficient working order, as the organ had deteriorated to the point where it was virtually unplayable at certain times of the year. Scaffolding and a hoist were erected in the late spring (leaving a suitable gap in line with the west door for bridal processions), and the organ was dismantled during the course of a fortnight in late May and early June. Much of the pipework (with which we wanted to interfere as little as possible) was left in storage on one of the church's magnificent side galleries, and the casework, building frame and pedal chests were left in situ. All the remaining internal components were removed to Bethnal Green for workshop attention. In July we held an open day at the works as part of that summer's St Albans International Organ Festival. As it turned out, the visit of several coachloads from Hertfordshire coincided with the main part of the "factory" phase of the Great St Mary's project. In the main workshop, the two double-rise reservoirs had been stripped down and were being completely re-leathered. The Great and Swell soundboards had also been broken down into their component elements, and the grids were being flooded with hot glue. In the metal shop, sheets of pipe metal were being cast for replacement Smith and Hill ranks, the alloys for which had been analysed for us from originals by the University's department of metallurgy. The upstairs workshop, where the console and associated action framework had been set out for restoration alongside the Choir soundboard, was also an important centre of attention. By this stage we had firmly established from its style of construction and materials (oak instead of mahogany) that the Choir soundboard pre-dated the Hill work. The opinion of Dr Nicholas Thistlethwaite (the University's consultant for the contract) was that it had most likely begun life as Thomas Parker's expanded Choir division in 1767. The bars had been covered in parchment (featuring a fascinating variety of nineteenth century legal texts), probably at the time of the Hill rebuild. In view of the soundboard's apparent origins, it was decided that the tables (as well as the bars) would be re-covered in leather in the traditional eighteenth century style. We returned to site in September, confident that the organ would be at least partially playing in time for Christmas. Restoration projects are notoriously difficult to timetable, as one never knows just what problems may surface once the sleep of decades has been disturbed. In this instance, as well as avoidable delays caused by the scaffolders, we had to contend with the discovery and subsequent removal of asbestos in the blower room, and the all too obvious presence (but frustrating elusiveness) of a rat corpse! The tonal finishing stage amounted to much more than the simple replacement and retuning of existing ranks, as we had in fact provided the instrument with a considerable body of new pipework. (This included the completion of Hill's "prepared for" Swell reed chorus, and a four-rank mounted cornet on the Great whose scales were based on surviving Smith pipes at Finedon Church in Northamptonshire.) Eventually we were able to leave for the Christmas break with only a few minor tonal and mechanical adjustments left to make. The organ was formally re-dedicated at a concert given on the evening of Tuesday 30 January 1996, at which the University organist, Stephen Cleobury, alternated at the console with David Goode in a programme of English and German music from the eighteenth and nineteenth centuries. A rendition of the G major Prelude and Fugue (BWV 541) gave the late twentieth century audience the chance to experience something akin to Mendelssohn's revival of J S Bach's music in England, and the concert ended with Handel's Fourth Organ Concerto, featuring the Cambridge University Chamber Choir and Orchestra. Considerable satisfaction was expressed at the time, and has continued to be since, at our success in reinstating the mechanical reliability of the instrument, and in rectifying some of its recent tonal deficiencies. The opportunity afforded by the refurbishment was taken to make complete records of the organ's historical pipework (carried out by an enthusiastic team lead by Dominic Gwynn), while Stephen Bicknell undertook a full survey of the casework, which it is hoped will form the basis of its historical restoration as soon as funds allow.